My increasingly graying hair and I have a new pattern. I feel like I design fairly regularly, especially now that I publish most seasons with Twist, and I'm always trying to appeal to a wide variety of people, but Tangerine Trees is really a design for me. I love wide ballet style necks, body darts, buttons and cuffs. I don't normally wear prints or complicated textured patterns. I love all types of designs, but this is a design that looks like something I'd have in my personal wardrobe. 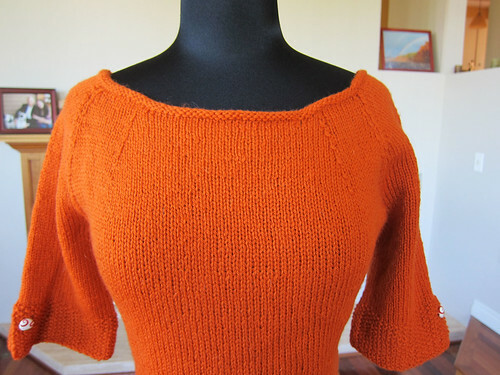 The garment is worked from the hem-up, with no seams except the underarm bind offs, which could be joined with a 3-needle bind off if you are really averse to grafting. The yoke features raglan shaping as well as an additional series of neck decreases which can easily be added to, to make the neck narrower. 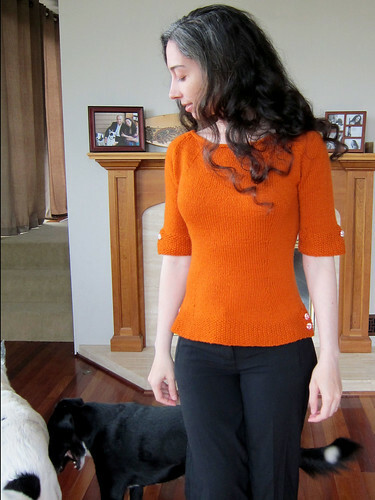 Short rows at each shoulder help to hide your underpinnings. I used fabric covered buttons on the cuffs and hem which gave me an excuse to dive through my stash of quilting remnants. If you like the photos, I have more details here and on the ravelry page, and the latter offer tons more photos. 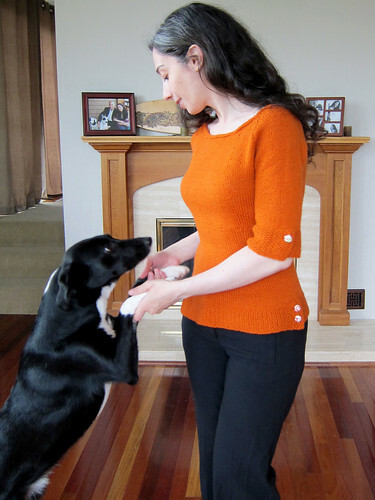 A big thank you to Laura Chau for tech editing my pattern and of course to my pups for photo-bombing me while I was trying to take serious pattern photos. That top is just so cute. Something I would wear too, if I ever get rid of these 'love handles' & slim down some so it would look great on me. I esp. like the neckline. Good Job!! That is gorgeous- I love the simplicity of it, and the pretty details at the neckline. I'm going to Rav to check out more details. Maybe it will be my new Fall project. This page contains a single entry from the blog posted on August 27, 2012 12:42 PM. The previous post in this blog was Tangerine Trees. The next post in this blog is Om nom nom.